While on an errand to Kelapa Gading, north Jakarta, I decided to stop at one of the shophouses to grab a light snack. I wanted something local, something that is worth writing about. So I came across a stall named Ronde Djahe, pulled over and parked as near as I could, but much to my irritation, it’s not open until late afternoon. Dang, how could I have not noticed the closed doors! So I decided to continue my search, just one last attempt before heading back to city centre. That’s when I noticed the sign “ Kedai Ice Cream Gentong”. Sounded interesting, so I pulled over. It was kinda appropriate too, since the day was somewhat unusually sunny. The shop is a small ice-cream shop offering limited set of ice-cream based dessert and pre-packaged tubs for take aways. On the staff’s recommendation, I chose Coco Ice, a dessert served in a clean-shaved young Thai coconut shell. 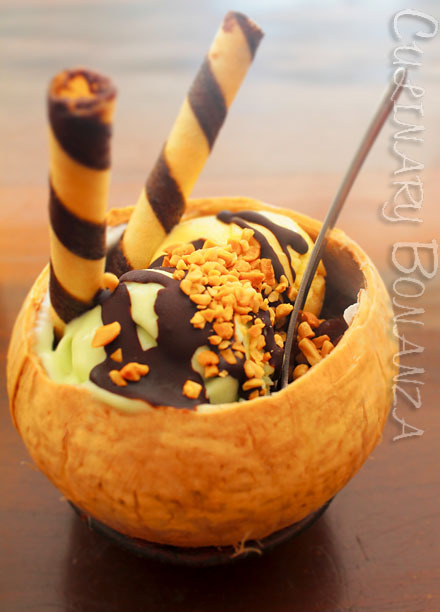 Inside the coconut flesh-lined hollow are 2 scoops of ice cream Gentong of my choice: jack fruit and avocado. 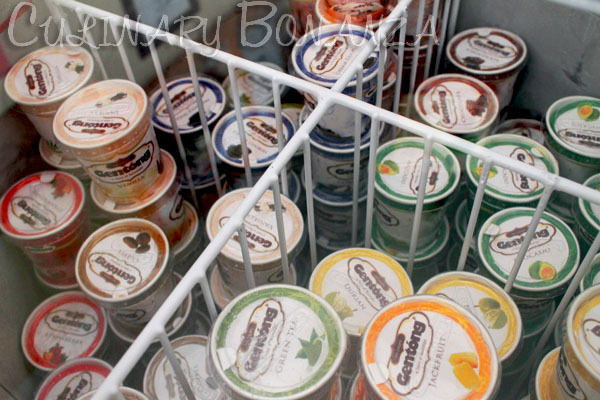 These are the most popular flavours besides durian. As I dug deeper, I discovered plain jelly juliennes and red bean toppings. This is an absolutely tropical icy dessert treat, perfect for a hot day! Ah, the downside of eating alone means that I can only sample so much food at one time. Lucky, the ice cream can be packed for take aways, which last until up to 3 hours outside the fridge. So I bought a few single cups of different flavours to try at home. I like the avocado & jack fruit flavours best, as these are the authentically Indonesian flavours. The ice cream itself is not too milky and quite light. The sugar levels in the ice cream are perfect. 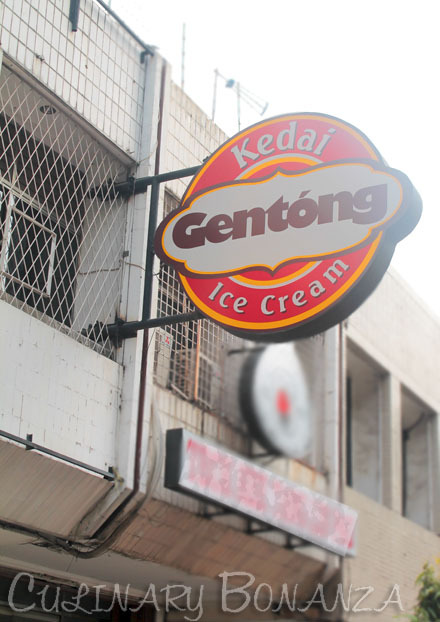 As I probed further, apparently Ice Cream Gentong is quite a popular souvenir from Jakarta. They provide sturdy boxes which are fit for airplane cabins and additional dry ice are readily added upon request so it can last up to 12 hours unrefrigerated. The price is somewhat borderline expensive for a traditional ice cream, in my opinion. As for deliveries outside Kelapa Gading, the minimum purchase is IDR 200,000 + delivery charge IDR 20,000 flat. Why didn't you try the durian one? That's too bad because their durian ice cream, in my opinion, is the best in town. Especially for only 17k per 2 scoops on a cone. Sparkling Champagne for Brunch? I'm In! !